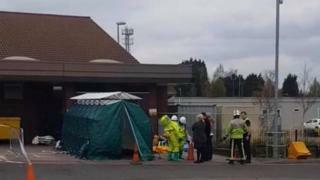 A man has been decontaminated in hospital after white powder was thrown on him, West Midlands Fire Service said. The brigade said he walked into Walsall Manor Hospital A&E at about 12.40 BST. He was isolated and the substance has since been identified by doctors. The fire service added the matter was being treated as a "domestic-related incident" and there was "not thought to be any risk to staff or patients". It has not been revealed what the substance was, but the brigade said there was no further cause for concern. In a statement, Walsall Healthcare NHS Trust said: "The male patient arrived at the Emergency Dept and alerted staff to a powdered substance on his body which is currently being tested by specialists. "The patient was isolated according to the correct decontamination procedures and did not come into contact with other patients." The trust added that the hospital remained open. An investigation by police is under way.